Three Options? 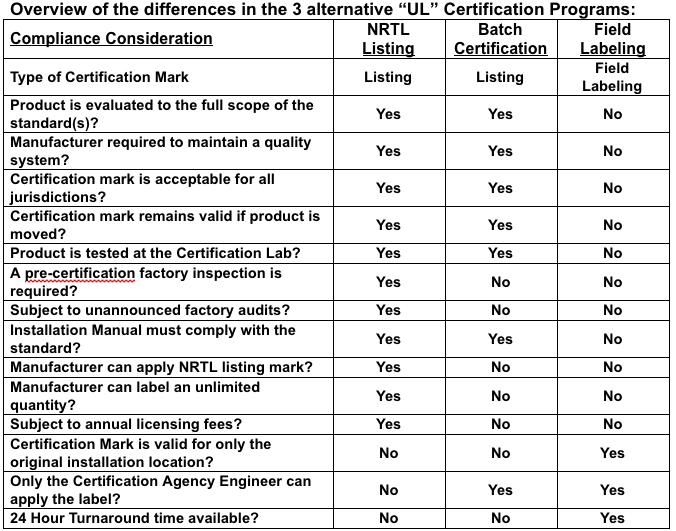 Many manufacturers are surprised to learn that there are actually 3 different types of “UL” product certifications available in the United States. This is important information for manufacturers who have avoided product certifications or who have had concerns with their existing certifications. NRTL Listing: A product “Listing” provides a manufacturer with the ability to apply the NRTL Listing mark themselves. However, there are many reasons why an NRTL Listing may not be the best certification option – higher cost and longer turnaround time are the main reasons. In addition, the program is simply not intended for custom products. Field Labeling: The alternative has always been Field Labeling. Field Labeling is well suited for custom and unique products. However, Field Labeling isn’t the best option for large order situations and when the customer requires a full product Listing. Batch Certifications: A new option has been developed at a number of NRTL Certification Labs = a Limited Production Run or “Batch” Certification. A Batch Certification is a great option for those who are looking for the benefits of a NRTL listing but without the hassle of maintaining quality procedures. For those Manufacturers who have a limited production run yet still require a Listing mark, the Batch Certification is your best choice. NRTL Listing: An NRTL certification to UL approved standard(s). The product is tested and evaluated at the certification lab. Upon a successful review, a certification report is issued. The manufacturer is then granted authorization to apply the NRTL mark to the UL standard. The factory is audited regularly for a review of their quality system and continued product compliance. If found compliant, the factory will maintain the right to apply the mark to their Listed products. There is no limitation to the quantity of units labeled with a NRTL Listing Mark. Limited Production “Batch” Certification: This program has many similarities to that of an NRTL Listing, but the manufacturer does not have to maintain a quality system nor is it subjected to factory audits. The product is evaluated to the full scope of the product safety standards just like an NRTL Listing. Upon completion of the review, the Certification Engineer will visit the factory and verify the construction of the product. If found compliant, the Agency Engineer will affix a Batch Certification mark (same as NRTL Listing) to the “batch” or quantity of units that have been fully built. Field Labeling: A one-time inspection for a single installation location to the UL (US) or CSA (CAN). In some cases, another ANSI approved standard may be used. A Field Labeling Engineer will travel to installation site or manufacturing site to evaluate the equipment. The review is of limited scope – electrical construction review and testing for fire and shock hazards only. Field Labeling does not involve fault condition or other destructive testing. Upon successful review, the equipment is affixed a Field Evaluation Label by the Agency Engineer. The Field Evaluation label is specific to the installation location, so relocating the equipment requires a re-evaluation by the Agency Engineer.